Arthritis is a degenerative process of the cartilage that protects joints. There are multiple types of arthritis. Osteoarthritis is the most common cause of arthritis and is a condition characterized by the breakdown and eventual loss of cartilage in one or more joints. Cartilage (the connective tissue found at the end of the bones in the joints) protects and cushions the bones during movement. Cartilage can be lost due to damage such as trauma, wear and tear, or inappropriate motion across a joint. Osteoarthritis known as degenerative arthritis is often associated with increase of age. Commonly affected areas of osteoarthritis include the hands, feet, spine, hips, and knees. In the foot, common areas include the big toe, midfoot and ankle. Other types of arthridities would include rheumatoid, gout, psoriatic, vasculytic, seronegetive etc. With continual motion across a joint cartilage eventually wears out or thins, causing pain and inflammation of the joint. Trauma caused by stubbing a toe or dropping something on the foot, sprains, or a broken bone. Lack of appropriate support or shoegear from high arches or flat feet. Poor alignment of the bones either genetically or otherwise, this would include bunions, hammertoes. 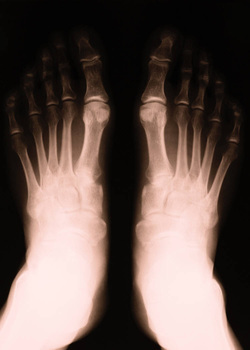 When evaluating your foot your doctor will take into account symptoms as well as additional findings and x-rays to be able to provide you with the most appropriate treatment. As many problems may look similar it is important to see someone that focuses specifically on the area of pain. Podiatrists have some of the most extensive training with new techniques and procedures to help you recover to your fullest. Oral medications Such as Nonsteroidal anti-inflammatory drugs (NSAIDs) are often helpful in reducing the inflammation and pain. Steroid medications available by prescription may also be needed to help appropriately decrease pain. Orthotic devices are prescription devices that are placed into the shoes that are made to fit your foot (much the same as glasses) to provide support to improve the foot’s mechanics or cushioning to help minimize pain. Using orthotics that are not made to fit your foot may actually cause problems and are discouraged. Bracing Bracing, which restricts motion and supports the joint, can reduce pain during walking or running. Immobilization by use of a cast or removable boot may be helpful in allowing inflammation to resolve and decreasing pain. Steroid injections can be used at times to help in delivery of strong medication to a local area promoting decreased inflammation and pain. Physical therapy uses exercises to promote strengthening, flexibility, and stability while decreasing pain and encouraging mobility. Surgery may be considered when appropriate conservative or non surgical treatment has been exhausted and to address significant pain.